HTC, the Taiwanese ODM company that designs and builds a huge number of Windows mobile phones, has launched two 3G models under its own brand. The company has sold phones under its Qtek brand for some time, in addition to the phones it sells to network operators such as Orange and T-Mobile, but it now plans to migrate Qtek products to the HTC brand. It has also launched its first range of accessories, including Bluetooth headsets and in-car kits. The two new models are claimed to be the world's first tri-band 3G Windows Mobile Pocket PC (the TyTN) and 3G Smartphone (that's the MTeoR). Those model names are a bit grisly, but they're perfectly in keeping with the company name as HTC stands for High Tech Computer, so it's clear that Titan and Meteor would have been too easy on my spell check. 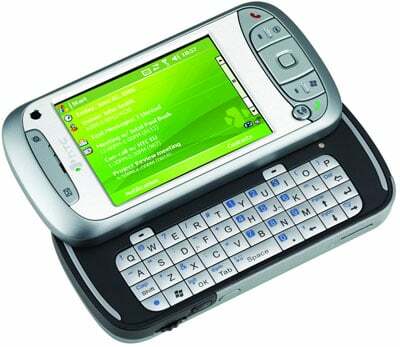 The HTC TyTN is a Tri-band UMTS 3G model with GSM, GPRS, EDGE, Wi-Fi, Bluetooth, and a mini-USB port. It features Direct Push email with Windows Mobile 5.0, internet browsing, synchronisation with Microsoft Outlook Calendar, Contacts and email, and the ability to work on applications in the Microsoft Office suite such as Word, Excel, PowerPoint as well as viewing PDF documents. TyTN comes equipped with a slide-out, ergonomic QWERTY keyboard and 2.8 inch colour display with touch-screen. It also features a jog wheel for easy, one-hand operation. There's a micro SD card for storage as well as a two Megapixel camera with macro mode, on-screen controls and DSC (Digital Still Camera) functionality, plus a second camera for video telephony. Available in black and silver, the TyTN weighs 180g. The HTC MTeoR, the world's first 3G Windows Mobile 5.0 Smartphone, is a candybar design that measures 112.4 x 49 x 14.8mm and weighs 120g, which is very similar to the C600 that HTC manufactures for Orange. It features Windows Mobile 5.0 Direct Push technology for immediate synchronisation of email, calendar and notes plus document viewers for PDF, Word, Excel and PowerPoint. Viewers, you’ll note, not full applications. The TFT screen measures 2.2 inches (again, like the C600) and the camera is rated at 1.3 Megapixels.